In my ongoing journey of discovery with Fozzie, I often wonder just what exactly is his issue. Is it really what you'd call reactivity, as in the fear-based reactivity that is so often mistaken for aggression? When he sees certain dogs, like those huskies and like my sister's dog Genghis, who have big fuzzy heads and those menacing pointy ears and can't walk a step without having a conniption fit, I think that's a part of it. Is it an excess of impulsiveness, and what you might even call joie de vivre? Just an irrepressible spirit that can't tolerate nutty contraptions like leashes, and the totally preposterous notion that a beast of such vitality could greet calmly and nicely? Does he just love other creatures too much to be calm about his feelings? When we see certain dogs and he shows signs of being excited, but not beside himself, and I allow him to approach and greet, and he does so with a sniff and a wag, I think that must be it. Is it prey drive? When we come upon one of our many neighborhood cat friends, and Fozzie goes into a mad fit of lunging and barking, straining at the leash until I think I'll literally go flying through the air after him, I think that's his diagnosis. I think Fozzie actually has a pretty complex personality, and that all these are probably true. I also think that he will learn new ways of being, and that he is already starting to understand that the sight of other creatures is no reason to completely lose his cool. We saw a neighbor dog on a recent walk, and I didn't have my treats, and there was no car to hide behind. So we used our "Whoops-backtrack!" 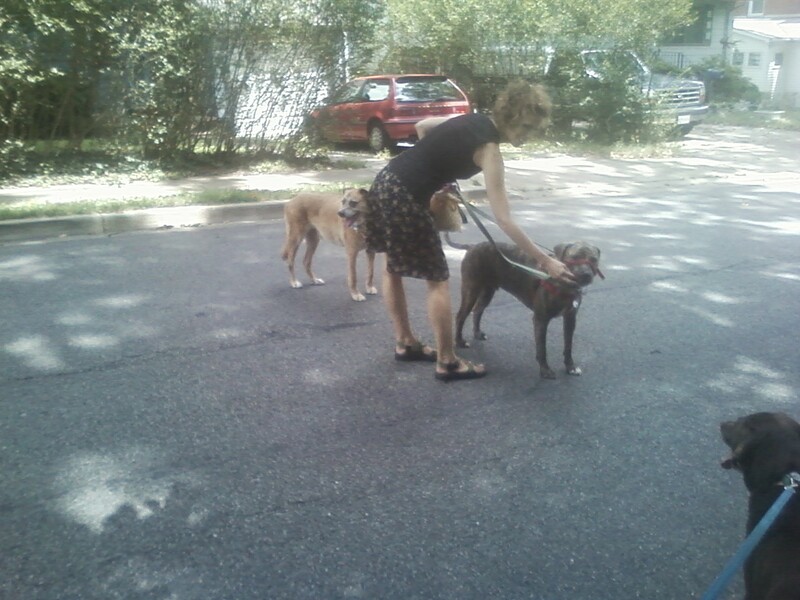 technique, and approached the neighbor--who was talking to another neighbor, holding his calm leashed dog--then retreated when Fozzie and Lamar started to react, then approached, and retreated again, until we were able to walk past in relative calm. At least the dogs were calm; I was talking to them in my nutty falsetto ... it's a good thing my neighbors are understanding. Another time recently, we had the opportunity to walk with our fellow trainer buddy Francine and a couple of the dogs she had that day. He had a few snarlies and lunges at the beginning, then was able to parallel walk with them for a few blocks. 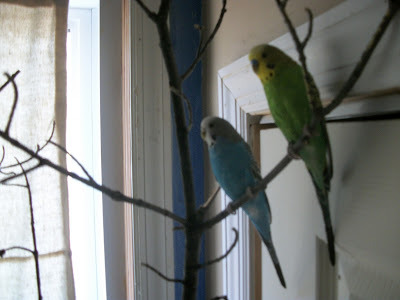 And the other day--this was perhaps the most exciting--my beloved budgies Ingamar and Flower were in their cage with the door open, having just turned in from a day of flying around "their" room. Fozzzie came into the room, and instead of panicking and chasing him out of the room, I asked him to sit and wait. He stopped his progress toward the budgies, looked at me, smiled, and sat! Which brings me to what I think is the root of my problem with Fozzie. Just like a nervous nellie dog owner who exacerbates all of her anxious dog's issues on the first day of reactive dog class by bringing her OWN issues to the table, I tend to panic and get all excited when Fozzie gets excited. If I could just be more consistent, firm, joyful, calm and clear in my messages to him, then he'd start to reflect those qualities as well. What do you think? Have you had any luck changing your own emotional responses, in order to better support your dog in sticky situations? This is so interesting. Sometimes I completely panic and forget to tell Finn to sit or stay. I feel like I am following her around while she is going crazy/nutso and pulling and dragging me. Why don't I remember to tell her to just sit?? I have been reminding myself of this more and more. My sympathies as I know what a challenge it can be to have a very "emotional" dog. I do think you are right in that they do feed off our energy. I also think their reactions can be very embedded into their muscle memory and it can really be a challenge to override that. Then there is their natural instinct (breed/type specific) to deal with. Yea, they sure are complex and there can be a lot going on. I also find it can be a catch 22 in regards to trying to be a very conscious participant vs my not being so hyper vigilent as well. All in all...everyday I just set out with the intention to do the best I can for my dogs and somedays are much better than others. This is such a thoughtful post. I definitely believe that dogs feed off our energy. I think of Honey as my healing dog. After having reactive dogs in the future, it took me a while to really understand she was a totally different creature and I didn't need to be so vigilant and on edge. I almost think everyone should spend some time with a mellow, non-reactive dog every once in a while to lower their stress levels and recover some level of trust when other dogs or people come around. Perhaps people who do a lot of fostering should sign up to provide respite care for service dogs in training just to have that restful time with another dog who has been bred and trained from the very beginning to be calm. I am the QUEEN of my emotional responses influencing my dogs. I don't like a certain person? Sadie doesn't like that person. 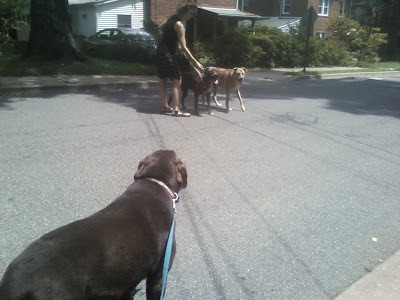 I get nervous about Maggie meeting other dogs? Oops. Her aggression rears its ugly head. I've said time and again, my biggest training challenge is myself - I need to learn not to expect bad behavior. I expect it, I tense up, and my worst expectations come true. On the other hand, when I am completely relaxed and expecting a positive outcome, then magically, reactions don't happen, aggression doesn't happen and everyone is on their best behavior. I have found that my happy falsetto voice helps both them and me relax and focus on the positive. Maggie's much less likely to be a bad girl when I'm sing songing about what a good girl she is. I should really start saying dog training affirmations in the mirror before each and every walk. My trainer thinks Delilah is disciplining other dogs. When she sees a dog acting out of control she thinks it is her place to correct the behavior. What do you think of that, Kirstin? I think that's very possible! I imagine a lot of dogs have that sort of reactivity. Fozzie, though, reacts even to the most placid, well-behaved, meek-looking pooches. Confusing and unproductive!